Wire & Sinker EDM Services -C&H Machine, Inc.
C&H Machine Inc. is a world class provider of wire EDM and sinker EDM services. Our state-of-the-art equipment and programming software give us the tools to complete complex projects with tighter tolerances and quicker turnarounds than other facilities. C&H Machine’s wire EDM and sinker EDM services are ideal for machining extremely hard materials with tight tolerances, small internal radii and complex shapes that cannot be machined by any other method. We specialize in cutting microkeratome Lasik blades for medical use in very high quantities. Each of the Lasik blades goes through an on-site, 100% optical inspection using our OGP Smartscope, as well as an ultrasonic cleaning process. C&H Machine’s EDM services have been applied in medical, aerospace, defense, laser technology, electronics, jewelry, athletic industry applications, and many more. Whether your project utilizes wire EDM or sinker EDM machines, we can guarantee tight tolerances for the smallest to the largest of parts, in any quantity from one to the millions. No industry or application is out of our range, and no project is too big or too small. As a full-service EDM job shop, C&H Machine can do it all! Our climate-controlled facility has 12 wire EDM machines, giving us the capacity and flexibility for high volume and complex EDM processes. We have one of the largest wire EDM machines available, which can machine parts up to 20” thick while fully submerged and cutting up to a 45-degree taper. Another of our wire EDM machines can cut parts using a 0.002” wire, leaving as small as 0.0015” radii on internal corners. We can “turn” features with our sophisticated EDM equipment on our “A axis” rotary table. 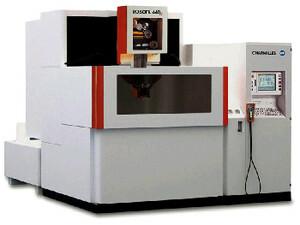 C&H Machine is one of few EDM companies with a fully programmable 6-axis EDM machine. 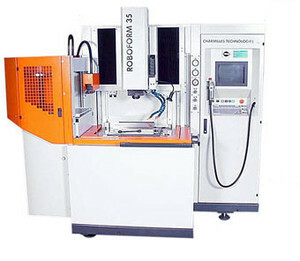 This machine is capable of producing complex corkscrews or threads, and/or rotating a part to complete multiple cuts which would normally require multiple setups. By completing these processes with one easy setup, C&H Machine saves you money by significantly reducing set up times. 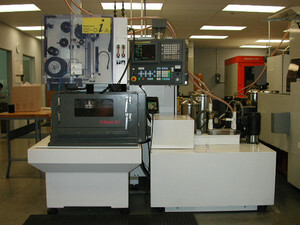 We are continually investing in our EDM technology to better serve our customers. Our sinker EDM services can create imprinted shapes in metal in blind cavities, without cutting all the way through a part. Sinker EDM works by first creating an inverse of the desired shape out of graphite or copper electrode using our high speed mill, grinder, or other methods. We then “sink” that electrode into the construction material to create the part. Sinker EDM is ideal for mold making, creating shapes in very hard metals, and for creating threads and tapping holes in parts before heat treatment. It is also very effective in creating tight tolerance profiles. C&H Machine utilizes a sinker EDM machine fully loaded with with a tool changer and C axis along a variety of in-house support equipment, giving us the versatility and efficiency to quickly complete your project. C&H Machine’s EDM Department uses DP Technology’s latest ESPRIT software to program shapes from the easiest to the most complex, straight from your existing SolidWorks files. Our wire EDM machines feature CNC controls that allow for intricate shapes to be created with outstanding precision. Our EDM machines can be programmed to cut parts with different shapes at the top and bottom—a circular opening at the top which transitions to a square opening at the bottom, for example. EDM is also ideal for creating thin walled parts, as it does not put any tool stress on the material being machined. 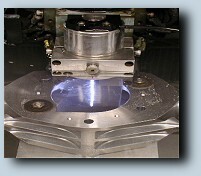 Contact C&H Machine for more information on our electrical discharge machining services.